Little reminders to keep you inspired! 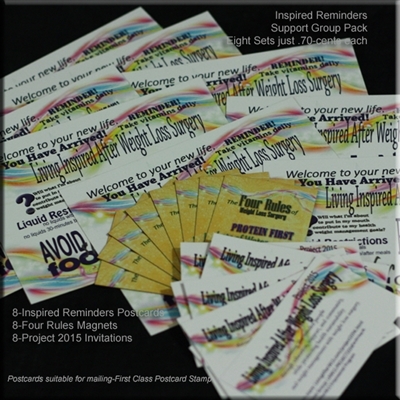 Convenient package featuring our Inspired Reminders to share with your support group members. Package includes 8 Inspired Reminders postcards (suitable for mailing with 1 First Class postcard stamp), 8 Four Rules magnets, and Four Rules Wallet Cards. Inspire your fellow WLSers with these terrific items, just .75 cents per set when purchased in this convenient 8-set package. Packaged in stay-clean cello envelope for convenient storage. I am always looking for information and products to share with the support group I lead. Being able to promote Kaye and Living After WLS is perfect. Keep the materials coming.